All four of the Socceroos 2006 World Cup matches are presented in full in this 4-disc numbered collector’s edition, beautifully packaged with embossing and metallic hotfoil. In good news for Australian Soccer (Football) fans, SBS has announced Digital TV viewers will be able to enjoy lots of extras watching the FIFA 2006 Soccer World Cup coverage on the SBS Digital TV and SBS Sports+ extra Digital only channel. SBS will broadcast all matches of the FIFA 2006 World Cup in 16:9 widescreen Standard Definition format, giving sports lovers a wider, clearer picture capturing more of the action. This channel will offer digital viewers the chance to receive the latest World Cup news via a sports ticker, current match stats via an updating timeline, as well as 2 live video feeds – 1 of the current off-air signal (smaller image) and the other being the ‘instant highlights’ feed or player cam (with a larger image and associated audio). The highlights feed and playercams are being produced by the host broadcaster specifically for digital applications like this. SBS will be collaborating with Virtual Spectator for the integration of the video and data feeds into the one service. Virtual Spectator will also be providing SBS with some virtual 3D elements of real time match incidents which will be utilised on the main broadcast. With the late night commencement times, retailers are expecting strong sales of digital television PVRs with hard disk drive recording capability (such as the Digicrystal 9000PVR) in the lead up to the World Cup. To record both the main channel and the enhanced channel, viewers will need a PVR with twin tuners. I cannot for the life of me find which australian tv channel will be showing the fa cup live. will be in australia on saturday so any heads up would be great. I want to get a copy of the game as no one is playing any replays. Do you know where I can find one? Any idea how I can watch the world cup televised England games from Oz?? I’ve just added a screen shot of the SBS FIFA World Cup digital enhancement channel taken during the England VS Paraguay match yesterday. 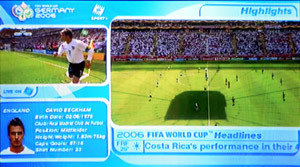 It shows how Australians with digital TV’s can see a sports ticker of World cup information, current match stats via an updating timeline, as well as 2 video feeds – 1 of the current live signal (top left) and the other ‘instant highlights’ feed (larger image at right with audio) and a player stats box in the bottom left corner which in this case shows england captain David Beckham’s stats. Remember that the FIFA World Cup 2006 is on SBS Radio as well as on SBS TV. I want to watch England v Australia. What station if any in Australia can I see it? If you meant the England vs Australia Rugby Union series, it’s broadcast on Channel 7. I brought a new HD wide screen tv for world cup 2006 and sbs digital does not seem to work on my tv. I have 80 signal strength but no quality. I live in beaumont hills. I would like to know if the problem is due to my antenna or the coverage in my suburb. 1. It’s a shame you didnt do more research before buying your new TV because the World Cup is being broadcast in SD quality not HD and the vast majority of Digital TV programs are SD. 2. The first thing to check is whether any of the other people on your street can view SBS Digital or call SBS on 1800 500 727 to see if they know of Digital TV reception problems in your suburb. 3. Remember that Digital Broadcasting Australia recommends using quad-shielded RG6 coaxial cable from antenna to receiver for reliable digital reception. The advice of a professional antenna installer should be sought if you’re in doubt asto which type of coaxial cables you have. 4. Try and rescan the channels on your STB. You didn’t say which STB you have, some are much worse at tuning channels than others. EDITOR: as stated above The SBS TV guide for the round robin Stage 1 group matches can be viewed at The SBS World Game website. Where matches clash because they are played simultaneously, SBS will show 1 match live and the 2nd match directly afterwards. Is there radio coverage of the wolrd cup in Sydney of the matches in English? I could only find them in other languages. Because of restricted broadcast rights, you generally can’t listen to FIFA World Cup matches for free online except the licenced broadcaster in your country eg: SBS in Australia, BBC in the UK etc. Do you know why Australia lost agaisnt Brazil. It was jersey colours of the goalkeeper Mark S. Imagine wearing RED and so obvious for the attackers finding the target. Look at Brazil’s goalkeeper’s colours, shots keep finding over the post. Let’s hope mark wears something not too bright. well done Simon Hill, Brilliant Commentary. Other sports commentators should take note. These Peer to Peer TV networks are from China, so you’re actually watching sports channel from China with chinese commentary and because many people will try to use them the stream may not provide reliable continuous coverage. I’m not linking directly to them because they’re illegal and I haven’t used them anyway because SBS TV in Australia is broadcasting all the world cup matches on Free to Air TV. Digital television viewers of SBS’s coverage of the 2006/07 UEFA Champions League are set to benefit from the addition of extra features on the SBS digital enhancement channel. Viewers with access to free to view digital television will be able to access instant highlights of match play, game statistics and player profiles broadcast on SBS Digital Channel 31. Audiences will also be able to see web highlights from games in a new ten-minute highlights package available on-demand through the SBS Video Player on http://www.sbs.com.au A highlights segment will be available for each day’s play. I am looking to purchase a DVD or VCR recording of 2006 Men’s World Soccer Cup match between Australia and Brazil during the Group rounds of play. If you cannot provide I would appreciate your directing me to who might in Australia. Many thanks for your help. Thank you. Just want to know if anyone knows where i can get some pictures of Ned Zelic sprawled out on the couch during the SBS 2006 World Cup soccer coverage. His refusal to sit up straight was a highlight for myself and my cousin. PLEASE any assistance is greatly appreciated.